This beautiful floor lamp is topped with a hand-assembled Eggplant polyester shade. Add a stylish and unique accent to your living space with this shapely floor lamp. The design features a stylish Eggplant polyester shade with beautiful texture. The shade is made-to-order and is hand-assembled by our skilled artisans in California. 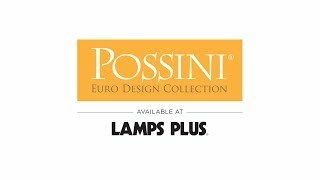 Stylish floor from the Possini Euro Design® line – perfect for living rooms, family rooms, and more.